Kurt Busch comes out of Turn 4 during Friday qualifying for Sunday’s NASCAR Cup Series race at New Hampshire Motor Speedway in Loudon, N.H. Busch won the pole. 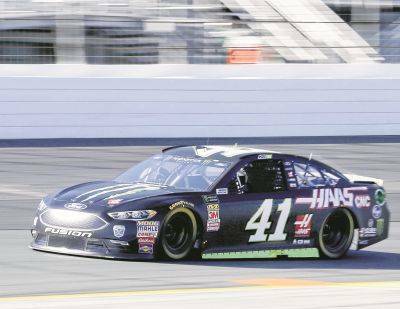 LOUDON, N.H. — Kurt Busch is set to crank up contract talks with Stewart Haas-Racing. Busch didn’t sign a contract for this season until last December — though it seemed a formality he would re-sign, his status was in limbo once SHR declined a contract option in August. “There’s a lot of things that move, so we’ll see how it all comes together,” Busch said. Busch, who won his third pole of the season, was the only one of the four SHR drivers to reach the final round of qualifying. He needs the boost from starting out front — Busch hasn’t won a race since the 2017 Daytona 500 and has just three top-five finishes this season. Martin Truex Jr., Kyle Busch and Kevin Harvick have 14 of this season’s 19 victories. Harvick and Busch each have five, Truex has four and the 16-spot playoff field is set to have more drivers qualify on points than through the automatic berths that come with a win. Truex, who won last week at Kentucky, will start second in Sunday’s race and Kyle Busch third. Harvick starts 14th. Truex is winless in 24 career Cup starts at New Hampshire and posted a career-best third-place finish in the July 2007 and 2017 races. Truex would reach a career milestone with a win — he’s never won Cup races in consecutive weeks. “He’s been fairly unlucky to not have won yet so far, but eventually that turns around,” Hamlin said. And if Truex does snag that lobster Sunday in victory lane, it’ll be a win to savor. “It’s one I want so bad. Winning here would be for me like winning at Daytona,” Truex said. Chevy’s 18-race winless streak dating Austin Dillon’s win in the season-opener at Daytona is the second-longest skid for the manufacturer since modern era began in 1972. The longest was 31 races from the 1981 to 1982 seasons.